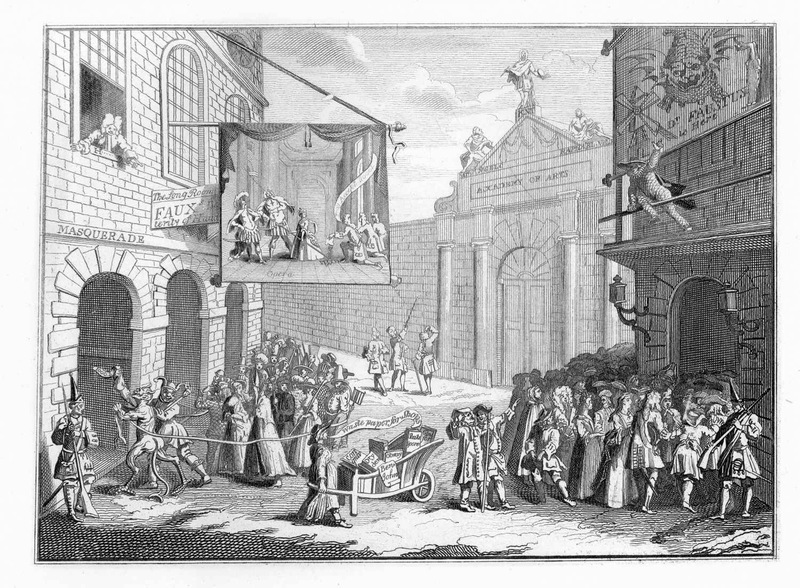 Hogarth was an avowed patriot who was concerned about the spread of foreign fashions in England. In his print, The Bad Taste Of the Town, also known as Masquerades And Operas, he attacked the Italian operas and singers that were displacing classic English theater and the masquerade dances thrown by the Swiss impresario Heidegger, which he believed were degrading public morals. The scene takes place in front of the Academy of Arts. Three men are walking beside its walls. The one in the center is the famous architect Lord Burlington, who favoured Italian styles; he’s talking to Mr Campbell, another architect. The other man is Lord Burlington’s postilion. On the left, a banner is advertising an opera. The image is itself a satire that depicts the Earl of Peterborough kneeling to offer the singer Francesca Cuzzoni £8,000 to perform in London. Next to it, a board inscribed with the words, “Long Room. Fawks’s dexterity of hand”, is advertising a performance by the famous conjurer Mr Fawks. 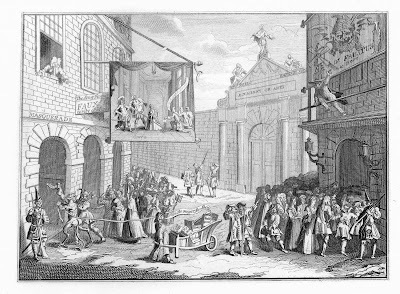 At the window of the palace, Mr Heidegger is trying to convince people to enter his establishment to see a masquerade. A similar job has the man in the harlequin costume on the right. He’s standing above the entrance of the theater where the pantomime “Dr Faustus” is about to be performed. It ran for two years and always attracted large crowds, while English plays were poorly attended. In the middle of the road, a man is selling the works of the great English dramatists, such as William Shakespeare and John Dryden, as waste paper. Finally, the grenadiers at the gates hint at the patronage of King George I, a German who had recently inherited the crown but didn’t speak one word of English.